Acute kidney injury is a serious clinical problem resulting in the rapid loss of kidney function. Unfortunately, there are no treatments that can induce kidney repair and many patients die from this condition. New research led by Dr. Kevin Burns’ laboratory shows that administration of a kind of stem cell from human umbilical cord blood (called endothelial progenitor cells) reduces injury and improves kidney function in an experimental model of acute kidney injury. The team further showed that the beneficial effects of the cell therapy were mediated through the release of small vesicles known as exosomes. 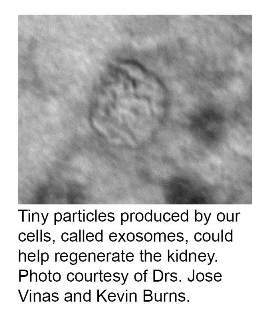 The study suggests that exosomes hold significant potential as a regenerative strategy for acute kidney injury. For details, please see the American Journal of Pathology. Co-authors: Dylan Burger, Jose L. Viñas, Shareef Akbari, Hajira Dehak, William Knoll, Alex Gutsol, Rhian M. Touyz, David S. Allan. Funders: Kidney Foundation of Canada, the University of Ottawa Department of Medicine, The Ottawa Hospital Foundation.